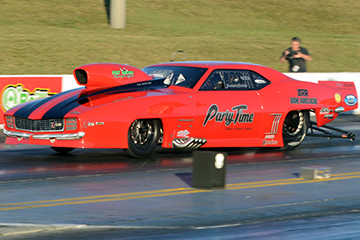 Jason Harris wins the Pro Nitrous class at the US Street Nationals at Bradenton Motorsports Park. Bob Harris the PDRA CEO with his son Jason Harris this weekend, Harris being teamed up with car owners Jimmy and Brad Boone and the Harris trailer and towing operation. “We are running good, qualified second, not pushing it right now but may have to in the finals if we get that far". We still have the Musi engines with Danny Perry who drove last year as crew chief now, which takes a lot of pressure off Jason when he is driving, it feels good to be in Florida right now, we had about a foot of snow just a couple weeks ago so this weather is real nice for us. We will be running PDRA this year and trying for a championship, taking it away from Tommy Franklin who won it the past two years. The final of Nitrous Pro Mod was set with Jason Harris and Lizzy Musi with Musi having the ET advantage by a good margin after her 3.68 in the semi finals over Jimmy Stoupas. Harris’ .017 reaction was a good start for him but Musi’s car faltered at the hit allowing Harris to ride through to a 3.76 at 199 and earn the event win. A good win for Pat Musi Racing as both cars run his power plants.